Biography of Russian Painter, Famous for Painterly Architectonics. A leading figure in early 20th century abstract art, Popova was one of the most important Russian artists who came to maturity prior to the Revolution in 1917. She is regarded as one of the co-founders of Russian Constructivism, and - despite her absurdly short career - helped to shape the development of avant-garde Russian art prior to the Stalinist clampdown in 1929. From 1912, she developed her innovative style of Cubo-Futurism from a synthesis of the splintered refractions found in French Cubism, and the force-lines, repetition and rich colours of Italian Futurism. After this, she joined Kasimir Malevich in his Suprematism movement, to explore a purer form of non-objective art, eventually producing her series of abstract paintings entitled Painterly Architectonics (1916-17), which employed Constructivist elements of surface, line, space and colour ratio. About 1921, after one final exhibition, she abandoned fine art painting altogether in favour of more practical art. Three years later she died of scarlet fever. Rated alongside Natalia Goncharova (1881-1962) as the dominant female artist in Russian art of the early 20th century, Lyubov Popova has been described by the art scholar Camilla Gray as the most outstanding painter - after Kasimir Malevich (1878-1935) and Vladimir Tatlin (1885-1953) - of the post-1914 abstract school in Russia. Born Lyubov Sergeyevna Popova in Ivanovskoe, near Moscow, into the prosperous family of Sergei Maximovich Popov, a rich textile merchant and active patron of the arts, and his wife Lyubov Vasilievna Zubova, who also came from a cultured family. As a youngster Popova developed a keen interest in sketching and drawing, as well as a love of Italian Renaissance art. At the age of 11 she started taking formal art lessons at home. In 1907 at the age of 18 she attended the private studio of Stanislaw Zukowski in Moscow, and in 1908 she enrolled at the School of Painting and Drawing in Moscow run by Konstantin Yuon and Ivan Dudin. The impact of this early training, especially its treatment of luminous tonalities reminiscent of Impressionism, is evident in early works by Popova such as Still-life with Basket of Fruit (19078, Private Collection). From the moment she entered her 20s, Popova travelled widely to learn about different styles of painting, and discovered that it was really icon painting (especially the Novgorod School of Icon Painting c.1100-1500), the murals of Giotto, and other Italian Renaissance paintings to which she was most drawn. In 1909, she visited Kiev, where she admired how Mikhail Vrubel (1856-1910) had restored old Russian murals and mosaics in the 12th century Church of St. Cyril; in 1910, Pskov and Novgorod; in 1911, several Russian cities, including St. Petersburg. In 1912, she spent time working in a Moscow studio called "The Tower" along with with Tatlin and Ivan Aksenov, and visited Sergei Shchukin (1854-1936) to view his collection of Post-Impressionist painting. (For details of Shchukin's fellow collector of French painting, see Ivan Morozov, 1871-1921). In 1912, she exhibited for the second time with the Knave/Jack of Diamonds artist group in Moscow, along with Mikhail Larionov (1881-1964), Natalia Goncharova, David Burlyuk (1882-1967) and others, all of whom were struggling to combine modern art with traditional Russian motifs. Popova herself - inspired by Russian architecture, icons and frescoes - began to develop a less naturalistic approach to art, although it was her first-hand experience of analytical Cubism during her visit to Paris which proved decisive. She visited the French capital in the company of Nadezhda Udaltsova (1886-1961) during the winter of 1912-13. Here, she met the Cubist sculptors Alexander Archipenko (1887-1964) and Ossip Zadkine (1890-1967), and studied at the Academie de la Palette under Henri Le Fauconnier (1881-1946) and Jean Metzinger (1883-1957), whose influence on her is evident in works like Two Figures (1913, Moscow, Tretyakov Gallery), and Seated Figure (1914, Ludwig Museum, Cologne). The latter is reminiscent of works by Fernand Leger (1881-1955) - one of the most famous Cubist painters - and the Italian Futurist Umberto Boccioni (1882-1916). In these canvases Popova demonstrates a new confidence and a more subtle integration of form and space into the transparent structures of both curved and rectilinear planes: something she developed further in pictures like Travelling Woman (1915, Norton Simon Arts Foundation, Los Angeles). Returning to France in 1914, Popova continued painting in her Cubo-Futurist style, but gradually came under the influence of Tatlin. Impressed by his constructions she took up collage and began to experiment with painted reliefs containing cardboard elements juxtaposed with richly coloured, impasto paintwork - see, for instance: Jug on a Table (1915, Tretyakov Gallery, Moscow). From 1914 to 1916, Popova was at the centre of avant-garde art in Moscow. Despite the wartime conditions she showed her work at several exhibitions including the Futurist shows "Tramway V" (1915) and the "0.10" (1916) in St Petersburg. During this time, as we can see from works like The Violin (1915, Private Collection), she was moving closer and closer towards complete abstraction. A further sign of Popova's conversion to abstract art came in early 1916 when she joined Malevich in his Suprematist circle, which included avant-garde artists like Aleksandra Aleksandrovna Ekster (1882-1949), Ivan Kliun (1873-1943), Nadezhda Udaltsova (1886-1961), Olga Vladimirovna Rozanova (1886-1918), Ivan Puni (1894-1956), Nina Genke (Genke-Meller) (1893-1954), and Kseniya Boguslavskaya (1892-1972). Popova produced a number of designs for the group's magazine Supremus (which never appeared). 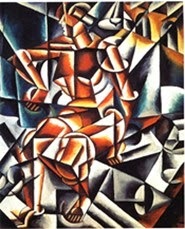 Then, in November 1916, at the Jack of Diamonds exhibition in Moscow, Popova unveiled her new style of concrete art in a series of six paintings which she called "Painterly Architectonics": see, for instance: Painterly Architectonic (1917, Museum of Modern art, New York); and Painterly Architectonics: Black, Red, Gray (1916, Tretyakov Gallery). In these works Popova adopted the rectilinear shapes and white grounds of the Suprematists, but her compositions were far more dynamic. Large, strongly coloured angular planes, overlap and intersect to evoke a constant state of energetic movement. 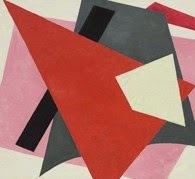 Later, in 1919, Popova would describe painting as a "construction," the basic elements of which were colour and line. Her Architectonic paintings illustrate this point, precisely. Although, like many young artists, Popova had tried to ignore the war in pursuit of her art, she could not ignore the Revolution. Indeed from 1917 onwards she identified completely with the aims of the Revolution, for which she produced a series posters, book designs, fabric and theatre designs. In 1918 she married the art historian Boris von Eding, with whom she had a son, and again showed her architectonic series of paintings at the state exhibition entitled: "Non Objective Creativity and Suprematism". During the Civil War (c.1918-20) she worked in the Fine Art Department (IZO) of the People's Commissariat for Enlightenment, producing agitprop posters in the style of socialist realism, and also instructed workers at the Proletarian Cultural Organization. She also taught at the State Free Art Studios, later known as the Higher Artistic and Technical Workshops (Vkhutemas). A member of the Institute of Artistic Culture (Inkhuk) from 1920, Popova was given the task of drafting a report on the teaching of art. In 1921, Popova participated in her final show, the "5x5=25" Exhibition of constructivist art held in September-October 1921, in Moscow, alongside works by four other artists whose work was shown were Ekster, Alexander Rodchenko (18911956), Varvara Stepanova (1894-1958) and Alexander Vesnin. Afterwards, in line with the Soviet demand that art be socially useful, Popova and her four fellow Constructivists announced that they were abandoning fine art to concentrate on applied art and design for the new workers society. From 192124 Popova became fully involved in Soviet art activities. She produced designs for stage sets, typography, and textiles. Tragically, she died of scarlet fever in 1924 in Moscow, aged 35. Paintings by Lyubov Popova can be seen in some of the best art museums in Russia and around the world.  For details of nineteenth century art in Russia, see: Russian Painting, 19th Century.  For more details of 20th century Russian painting, see: Homepage.